2 Million Candlepower Li-Ion Spotlight. Cordless, super-bright power, so you're set for whatever hits you! For the day-to-day (auto maintenance), the fun (camping, boating, the outdoors) and the not-so-much (electrical outages, roadside emergencies.) Take-along design, for use just about anywhere you need a bright light! Integrated rechargeable battery means no batteries needed! 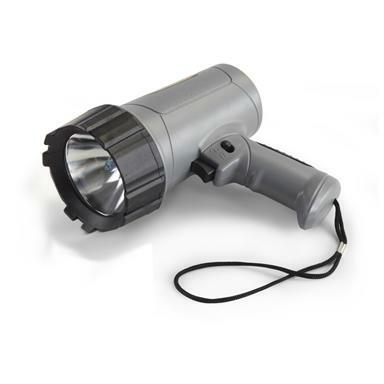 2 Million Candlepower Li-Ion Spotlight is rated 2.2 out of 5 by 14. Rated 1 out of 5 by moyo from poor good light for maybe 2 recharge then dead. Rated 1 out of 5 by Tom K from not as expected No center beam. Not as bright as other 2 million c.p. lights I have had. Am returning it. Rated 1 out of 5 by Mike from No way is this 2 million candlepower not a spotlight by any stretch. Rated 1 out of 5 by Bill from Best Described as JUNK! This product is not as described. I doubt it produces 2 Million Candlepower or even 1 candlepower. Beam is narrow, more yellow in color than white, it is not properly focused and it begins losing intensity after a few minutes of operation. It fails to hold a usable charge. Even though I received it 3 months ago and I only used it twice, I will contact SG to see if they will honor my return request. The return authorization form I printed reads "non-returnable item". SG should remove this product from theirinventory. A one-star rating is too high for this product. Rated 5 out of 5 by Bob357Magnum from So Far so good, Lightweight, powerful light, would suggest to a friend I really like this light, it is lightweight and is very powerful, have only had and tried a couple of times, but so far am pleased. Like the way of re-charging from wall plug or cig. lighter in boat. I would recommend this light to anyone. Rated 1 out of 5 by Bill from Not waht I expected! This product was delivered on time. However, this spotlight is not what I expected. The beam of light it projects is narrow, only lighting an area about 5 or 6 feet wide at 100 yards out and the beam is poorly focused. The light is more yellow in color than bright white. I doubt it produces 2 million candle-power as advertised. The light it projects is not as bright as that produced by a 1 million candle-power spotlight that I own. I may return this less-than-satisfactory product to Sportsman's Guide. Rated 1 out of 5 by Dave H from Dim Spotlight I would save my money and buy a better light...this one just isn't bright. Charged it according to directions, and beam barely made it to the halfway point (about 90 yards) into the field we were trying to look at. Sending this one back.